No, you probably won’t. Here are four reasons why. Writing a book involves a copious amount of editing. You write it, and rewrite it, and rewrite it. And then an editor looks it over and tears it to pieces and you rewrite it again, and probably again and again. Writing a book requires you to put aside your ego. You’ll get plenty of criticism both before and after it goes to press. Gotta have a thick skin. Writing a book will probably cause you to lose money. Most self-published authors end up with a garage full of volumes they can’t sell plus a hefty credit card bill. As an alternative, finding a paying publisher is almost impossible, with enormous odds stacked against you. If you want to earn cash, you’re far better off to pursue a part-time job at McDonalds. These are the down sides to writing a book, and you should seriously consider them before you think about starting. 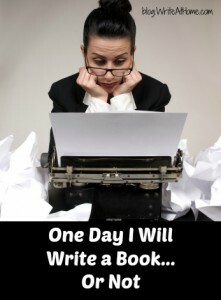 However, if you’ve just cleared this checklist and said to yourself, “I don’t care what she says, I really am going to write a book some day,” well, then, there’s hope that you might do it. You have the kind of perseverance you’ll need to make your dream happen. What’s next? I like the advice of my daughter Lisa, creator of The Traveling Mandolin blog and a professional writer. The article I quote below was originally published here. Here is a simple concept that inspires everything I do: hard work is more important than talent. You can be ridiculously talented, but if you don’t work hard, it means little to nothing. However, if you have a driving passion and a determination to get better no matter how hard it is, you have a chance at accomplishing your dream. If this dream involves writing, but you feel like you don’t have much talent, don’t let it bother you. If you diligently follow these seven steps, I guarantee that you’ll find the path to excellent writing. It might take years or even decades, but if you really want to write, nothing will stop you. Write a novel (or series of short stories or articles or memoir or nonfiction book). Don’t worry about being right or wrong or clever or original or good. Just write it. While you’re doing that, read a couple dozen books in your genre, and a couple dozen books in completely different genres. Read books about writing. I recommend Elements of Style by Strunk and White, Writing the Breakout Novel by Donald Maass, Stein on Writing by Sol Stein, Self-Editing for Fiction Writers by Browne and King, and Sin and Syntax by Constance Hale. When you finish your book, start identifying the weak points (ask a trusted friend to help) and revise. Write another novel/short story/article collection/memoir/nonfiction book, or completely rewrite the one you already have. Revise, revise, revise. Try to publish your work. Get rejected. Revise some more and repeat. Repeat steps one through seven until your writing is excellent. And then keep on working. Nobody said this was easy— but after all, things worth doing rarely are. So there you have it: the drawbacks you need to consider, but also the steps to actually writing your own book. Oh, and one more piece of advice: when you meet an author, refrain from telling her that “Some day, I’m going to write a book.” Instead, just do it. * Which is why I strongly recommend an interactive writing course, with feedback from professionals, such as offered by WriteAtHome.com. We’d love your comments and opinions on this article. Please leave them in the reply section below.